The Son Season 1: Favorite Moment, Craziest Scene and More! If you missed out on The Son Season 1, you missed out on an exceptional show. The story of the Eli McCullough both as a young boy and an older ranch owner was mesmerizing in every way. Check out what we thought stood out the most on The Son's freshman season. If you want to see what you missed, you can watch The Son online right here via TV Fanatic! After the horror of watching her son, Jonas, get shot (and eventually recover), Sally deserved a little bit of me time. Phineas took her for a night out on the town and it was probably the most delightful thing she'd ever done in a long time. She never wanted to spend her entire life on the ranch and going out with Phineas reminded her of that. We loved seeing Sally dressed up, and her antics at the club were a lot of fun to watch. From the very beginning, it was obvious these two had intense feelings for each other. While it might not be fair to Sally and the kids, the fire between Maria and Pete can't be denied. These two belong together. Neptune came onto our screens during the ambush on the seditionists. He has no fear, not even of someone as horrible as Niles Gilbert. He has super skills in the gun department and is fiercely loyal to the MucCullough family. Who is this guy and where did he come from?! We want to know more! Eli scoffed when Maggie read his fortune from her hat full of rocks. What he didn't know was that she didn't tell him everything. She kept the darkest parts of his future secret until he stole her horses and left her to die. Then she shared everything and put a curse on him to boot. It all seemed crazy until it all came true. It makes you wonder what else Maggie might have shared that we weren't privy to. What a shocking opening to The Son Season 1 Episode 3, "No Prisoners"! We all knew that Eli had a dark side, but we never knew how dark it was. After being turned down for a loan, Eli fantasized about scalping the banker. As far as he was concerned the banker was now the enemy and fair game for attack. While it didn't really happen, It certainly caught our attention. Not only was this one of the craziest scenes of the season, it was also one of our favorites! We have nothing but contempt for Niles Gilbert who seethes with hatred for those he doesn't quite understand or want to understand. If they're different from him, they're the enemy. We still don't understand his tolerance of Neptune, but we have an idea it has to do with Niles' respect for Eli. Still, we can only imagine what horrible thoughts rumble through his sick, racist mind. If only someone would tie him up and teach him a lesson! Sally: Should we cancel this party? Pete: We can't. We gotta show the world south Texas is a great place to do business. Permalink: We can't. We gotta show the world south Texas is a great place to do business. Great goddamned way to start a birthday party. Permalink: Great goddamned way to start a birthday party. 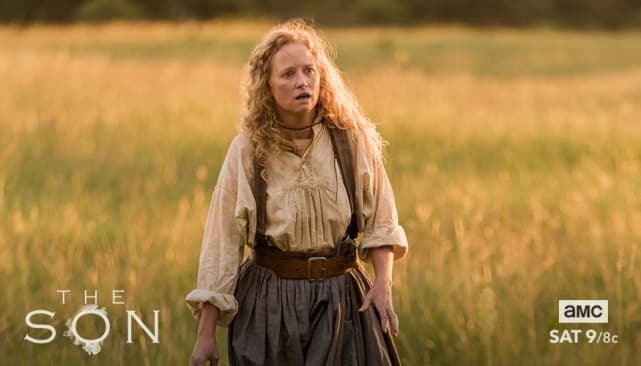 The Son Sneak Peek: A Secret Discovered! The Son Sneak Peek: A Secret Speakeasy! The Son Sneak Peek: A War Begins!